Sony believes production of a camera's key components in-house enables them to work better together, producing better cameras. 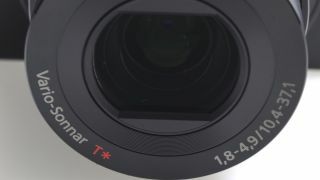 Speaking to TechRadar, Frederik Lange, senior product manager at Sony UK, said: "As we are the manufacturers of lenses, sensors and processors, that gives us an advantage. "When you produce the different components in-house, our engineers can balance everything for optimal performance." Talking about the new Sony RX100 premium compact camera, which features a 20.3 million pixel CMOS sensor, an f/1.8-4.9 3.6x optical zoom lens and a Bionz processor, Lange also told us that the camera has the capability to be a "game changer". Several other manufacturers are known to bring in components from other companies for their cameras, while Sony itself is known for producing sensors for several other camera producers. The Nikon D800 is widely believed to feature a Sony sensor, while the iPhone 4S is also reported to carry a Sony camera. Although the lens on the new Sony RX100 is produced by Carl Zeiss, Lange said that the design and engineering was completed by Sony in-house. Lange said that one particular challenge for the company was to produce a lens with such a wide aperture to work in conjunction with the large sensor size. The Sony RX100 has the brightest lens currently available on the compact camera market, and is designed, along with the sensor and processor, to help in low-light shooting conditions. The RX100's maximum aperture is, however, matched by the Olympus XZ-1 which has a 28-112mm f/1.8-2.5 lens and the Samsung EX-1 which has a 24-72mm f/1.8-2.4 optic.